At the Berlin Conference, we provided an overview that shocked many. 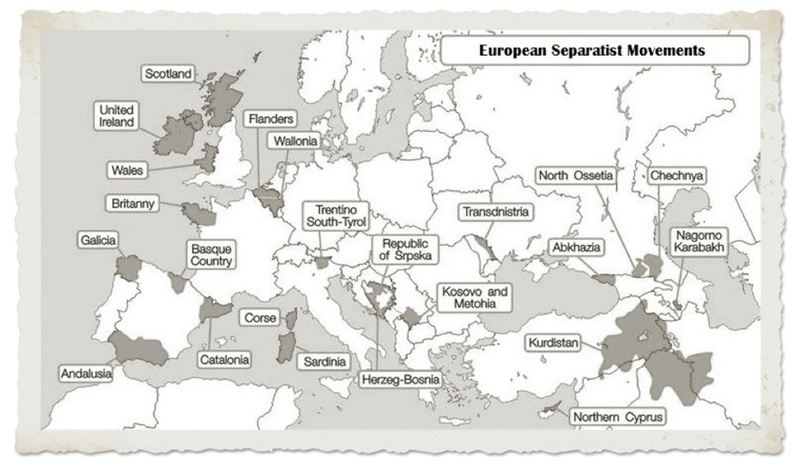 Most people had paid not much attention to separatist movements that were popping up throughout Europe from Scotland, which comes up for a vote in 2014, Britain talking about leaves the EU, right down to Spain. The major trend everyone has just assumed was the “unification” of Europe was in play. In our Berlin Materials (soon to be made available for non-attendees), the trend beneath the headlines is anything but unification. There is a rising trend of disunity and there are even those in Texas starting to make noise about separating from the USA. This deunionization is actually part of the Cycle. Just posted you will find, They Watch Everything – But Why? The Rising 3rd Party, explaining the behavior of government in light of the clinical findings of Stanley Milgram. Politics is starting to meltdown. Both the Democrats who are Marxists and Republicans who are confused and ready to start handing out flowers in airports begging for support for what purpose they do not know, are leading us down the toilet at rapid pace. Meanwhile, the bureaucrats are trying to strangle the chicken by the neck to get that last golden egg. We are fighting beliefs. It matters not if we agree with those beliefs, all that matters is what THEY (opponents) believe in something even if they are confused. Adds are being attached to YouTube videos preaching to join them to hunt down and tax the rich so they do not have to pay. Nobody seems to have read Atlas Shrugged. What happens if those who produce and create jobs go on strike and say enough is enough? They are doing that by hoarding their cash and waiting to invest. Liquidity has collapsed in Europe and America as capital sits with record levels of cash befuddled without a clue of where we are headed. While the chart on the collapse of the Roman Monetary System has been illustrated many times on this site, behind that stands the breakup of the Roman Empire, which is also largely overlooked by most historians regarding its role within the cycle and its causes. 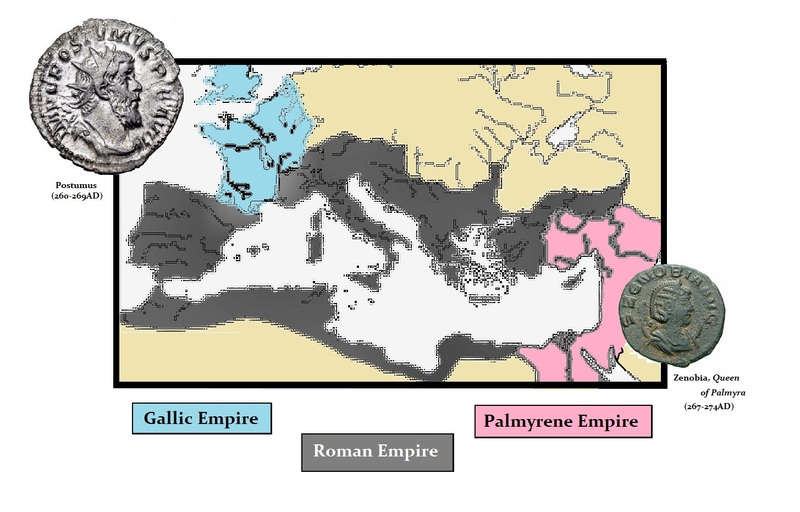 The Roman Empire actually split into three parts because of the collapse of the monetary system. Economics is the great mover and shaker of society. 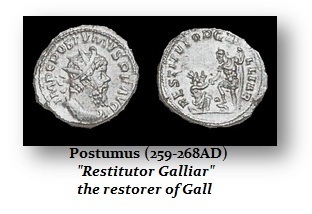 It forms nations by synergy to cause people to come together, but when politics turns nasty and corrupt extracting from the people more than they BELIEVE is fair, economics becomes the great destroyer as well, In Europe, there was the Gallic Empire that broke away from Rome led by Postumus (259-268AD) composed at first of Britain, France (Gaul) and Spain. In the East, there was the Palmyrene Empire led by Queen Zenobia who has been the inspiration for all the various Warrior Queen movies and cartoons.